From a design perspective, eucalyptus strand woven flooring is a natural (pun intended) for home design in 2018. Made from compressed eucalyptus wood, this flooring lends itself to an array of design functions and adds considerable beauty to any room. It has several advantages for interior design purposes with few disadvantages, and is an excellent choice for active families or homeowners with pets, due to it’s insanely high hardness ratings. 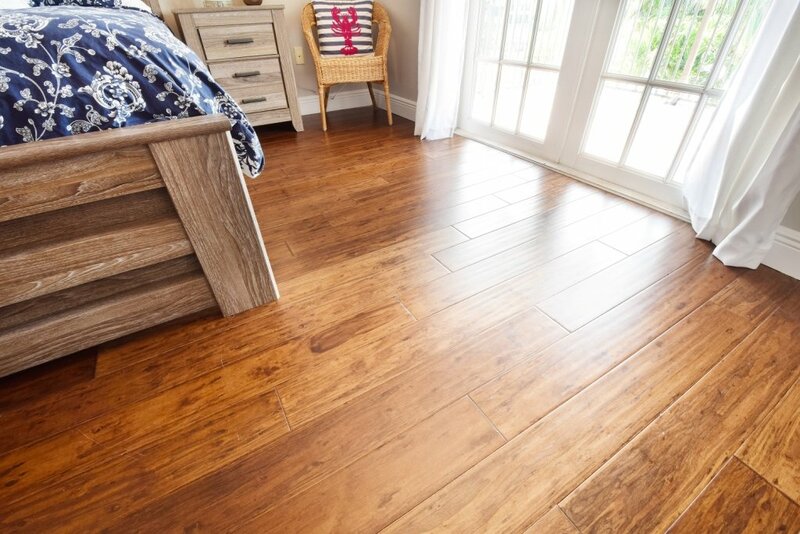 Eucalyptus strand woven flooring has all the beauty of natural wood. It comes in multiple colors from light golden to deep brown to fit in just about any color scheme. The wood grain itself is fascinating and varies from plank to plank. From a design perspective, you can create a unique look starting with the flooring or use the floor as an accent to almost any style. Installing eucalyptus strand woven flooring is similar to many hardwood floors. The floor boards should be allowed to breathe in the client’s home for 72 hours before installation. This time allows the wood to acclimate to the climate and moisture level in the home. However, this flooring has distinct advantages over other hardwood floors, because you can install it in areas that traditional hardwood floors won’t work. 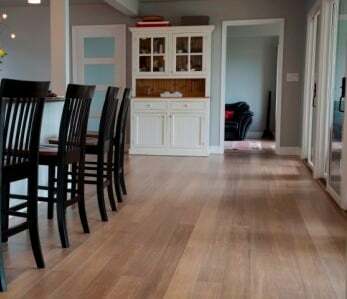 The engineered eucalyptus floor is the hardest wood flooring on the market; therefore it works in commercial settings as well as over concrete basement floors. 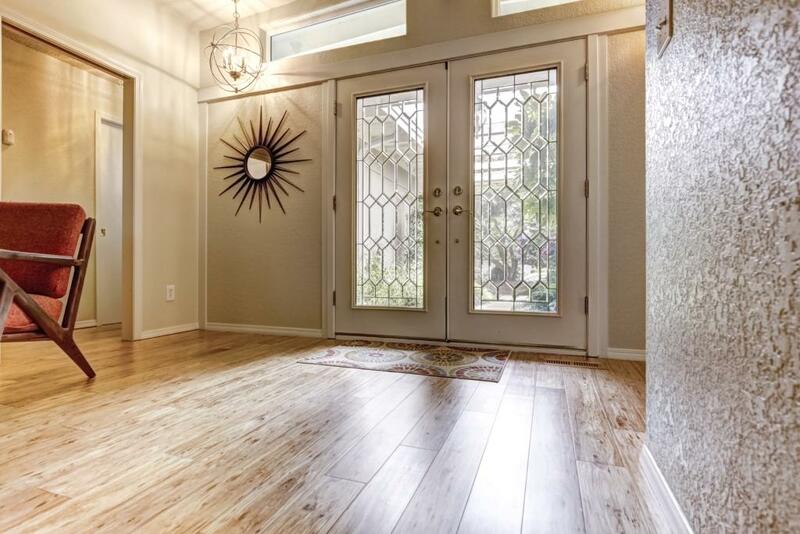 One of the biggest issues with hardwood floors is that they don’t perform well in high-traffic areas, especially if you have kids or dogs in the house. However, the eucalyptus strand woven flooring solves this hardness problem. 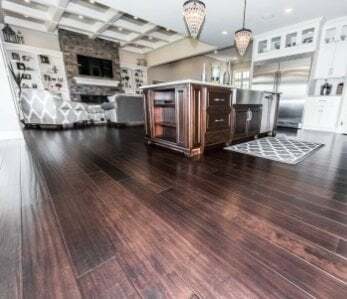 While the look and feel of this flooring is similar to traditional hardwood, it is 3X harder and better able to stand up to hard wear-and-tear that an active family would put it through. This fact alone makes it ideal for the spaces in the home that get the most action such as the kitchen and family room. Green construction that is eco-friendly and sustainable is the top trend in residential homes. It is cost-efficient and also helps reduce the carbon footprint for homeowners. 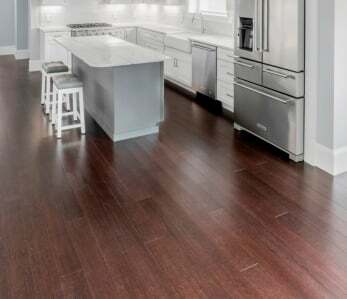 This eucalyptus flooring is ideal for the eco-friendly trend as it is a farmed product and it regenerates in a 3-to-4 years, making it more sustainable than other hardwoods. comply with the Lacey Act, meaning that they are sourced legally using methods that minimize impact on the environment. Adhesives in the flooring are zero-VOC; floor finishes are also zero- or low-VOC. 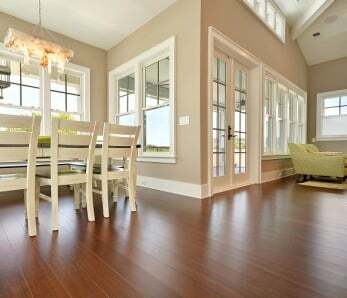 Therefore, homeowners can be assured that floors don’t emit harsh chemicals into the air or on the floor surface. This makes it safe for children and pets. Beyond the economics of a design using sustainable materials, just the knowledge that your design isn’t decimating global resources feels good. Affordability is one of the detriments of traditional hardwoods because it can catapult you over your budget. However, eucalyptus strand woven flooring is affordably priced at $3-to-$5 per square foot. When you add the longevity it provides because it doesn’t need the delicate handling of other hardwoods, the practical value increases. 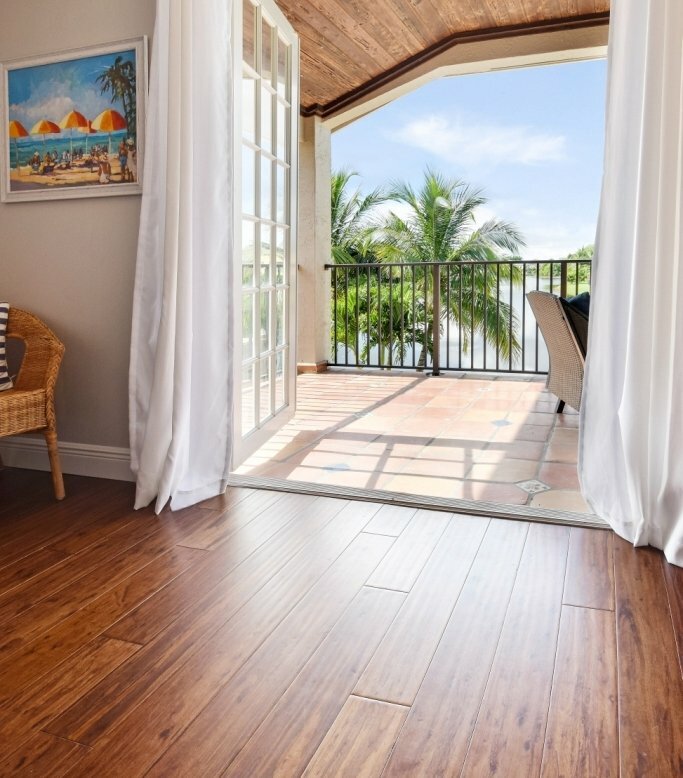 Wood flooring in general is very versatile in that the wood typically enhances, matches or contrasts nicely with room designs in almost any style choice. Even ultra-contemporary room design can be complemented with the right hardwood floor. The range of wood grains in the flooring also lends itself to matching grain to the atmosphere of each room. More color and knots in the wood grain offer a casual atmosphere for country cabins or family rooms, while the smoother grains work well with formal settings such as a dining room or living room. There is certainly a lot of personality that you can add to any room with this eucalyptus flooring. There is no question that renewable materials are on the top of everyone’s list of design trends in 2018. 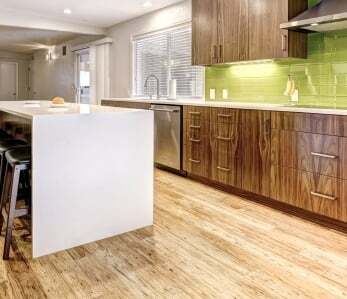 Designers are finding that customers and contractors are asking for more options in sustainable materials for new construction and remodeling contracts. With this trend, 2018 is sure to be a boom year for eucalyptus flooring. It meets the needs for sustainable materials; yet, it is also affordable and versatile. Ideal for homes with active families and busy schedules, it doesn’t need special handling. Families can be themselves and feel completely comfortable in their own homes, while enjoying the warmth and natural colors that hardwood flooring brings into a home. Care and maintenance for the eucalyptus flooring is minimal. It is difficult to dent, and sold in premium widths and lengths (wide planks), making for faster installation. Additionally, it is moisture-balanced to work in every U.S. environment including rainy Midwestern states, vacation homes on the beach and getaway mountain cabins. Lastly, it will increase the resale value of any residential home. If you want to add hardwood floors into your next commercial or residential design, you should seriously consider eucalyptus floors.